Ancient Temples and Voyage at Sea! 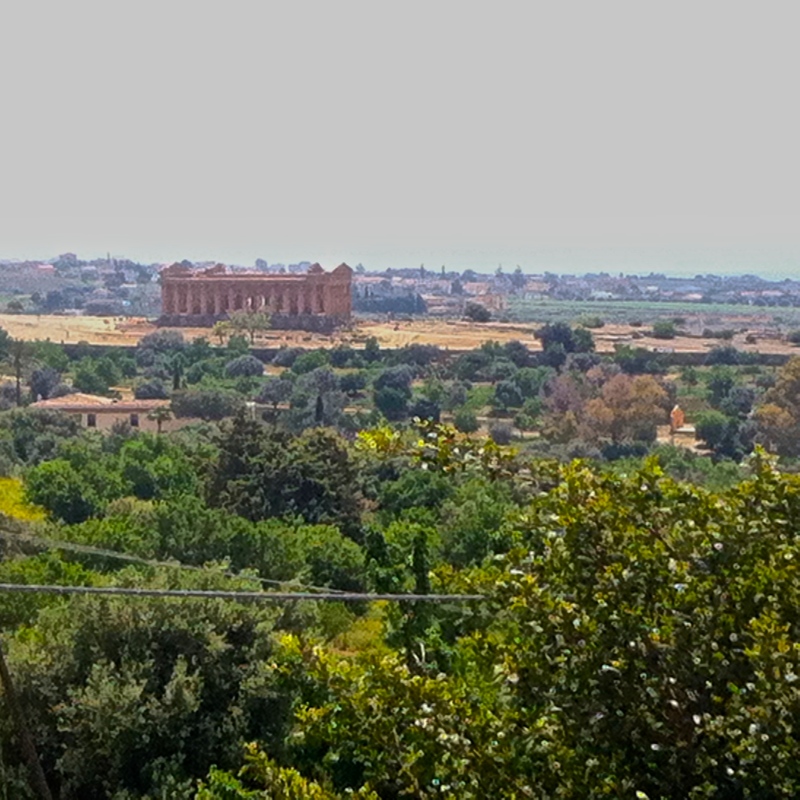 I visited the ancient ruins of Agrigento, on the southern coast of Sicily last week with Accursio as my tour guide. 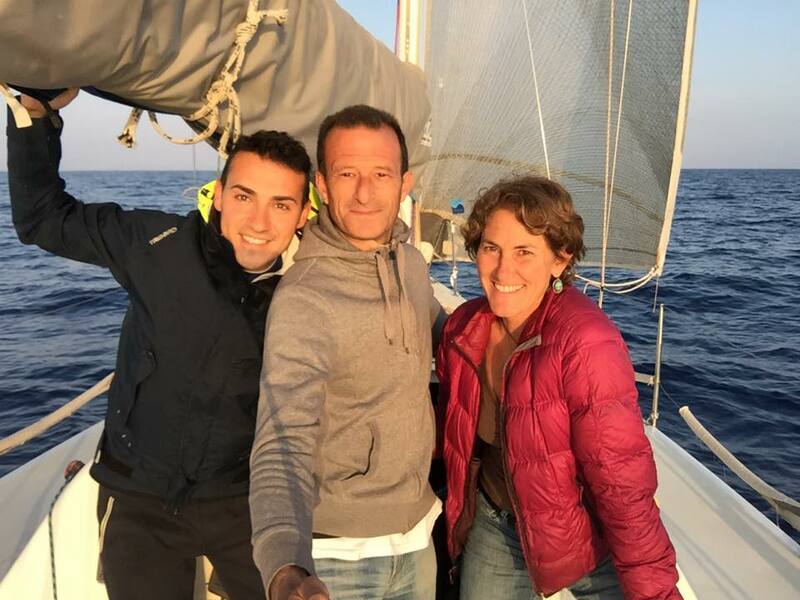 Then hopped a racing sailboat with Giacomo and Michelangelo back to Siracusa on the SE side of the island to deliver the boat for an upcoming regatta. Plan B was made and I ended up back on the farm near Messina, visiting for four more days with Nadia, Andrea and Lucca, playing with critters, gardening and fixing a fence….and attempting to make pasta, the Sicilian way. Hmmmm…never knew just how many details and nuances there were to making such a simple meal! 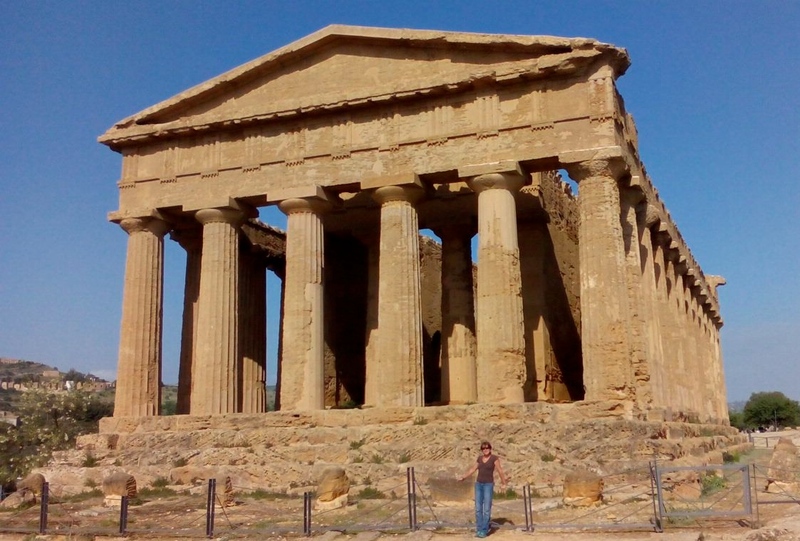 Agrigento is a small city on the southern coast of Sicily where there are remains of ancient Greek temples and an archeological museum housing many artifacts from the sites. The main temple sits high on the hillside and can been seen from miles away as you approach the city. 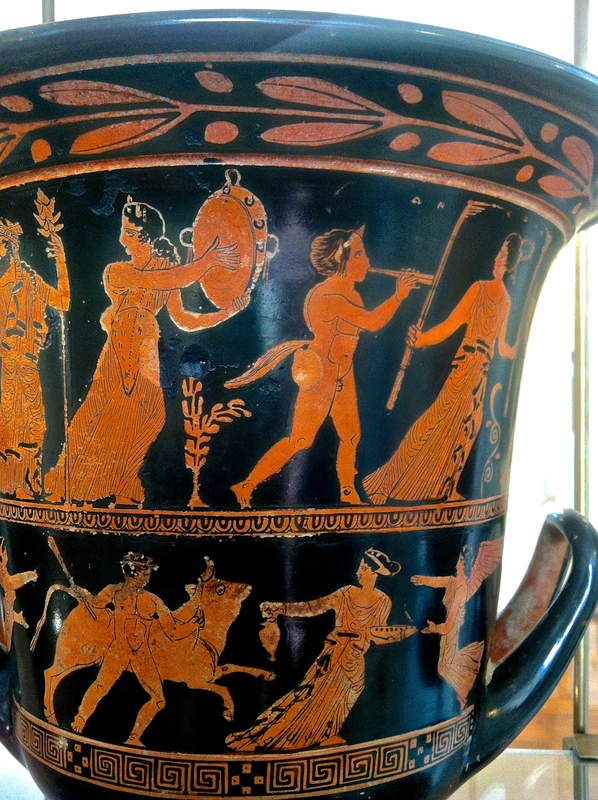 In the museum there are perfect “hand thrown” vases, intricately painted, depicting Greek gods and daily life, in exquisite fine detail, dating back to 700 BC! There are also many small clay figurines with classic Greek facial features, bronze tools from the Paleolithic era, and a giant reconstruction of a stone figure, one of many that adorned the largest temple. 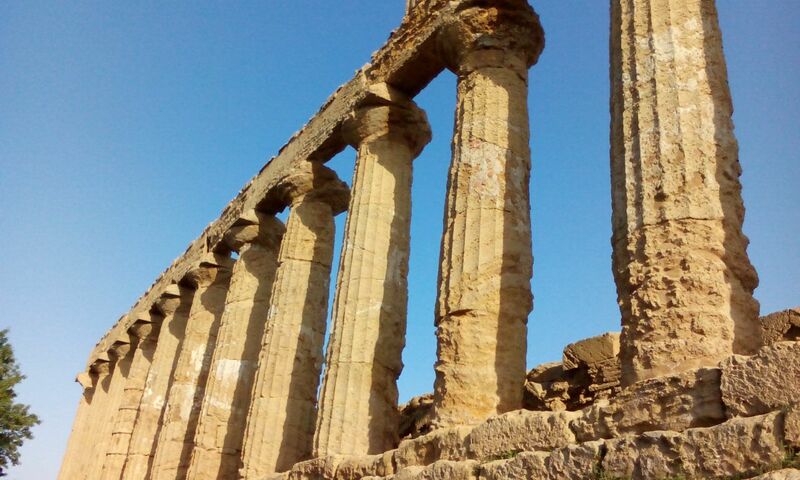 So many cultures have been in Sicily, from the Norse, Normans, Arabs, Turks, Spanish, Greek and Romans. A friend once told me about the Vikings in Sicily and mentioned it may be how the Italian name, Biondi (blondes), originated? 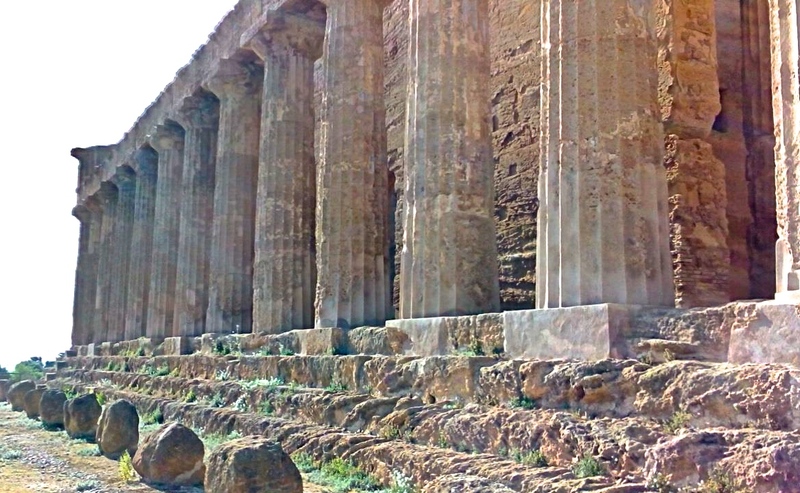 The architectural remains of some of these cultures are still evident today in Sicily. When I work the earth in farm gardens I imagine all who worked the land before me and it gives me chills. 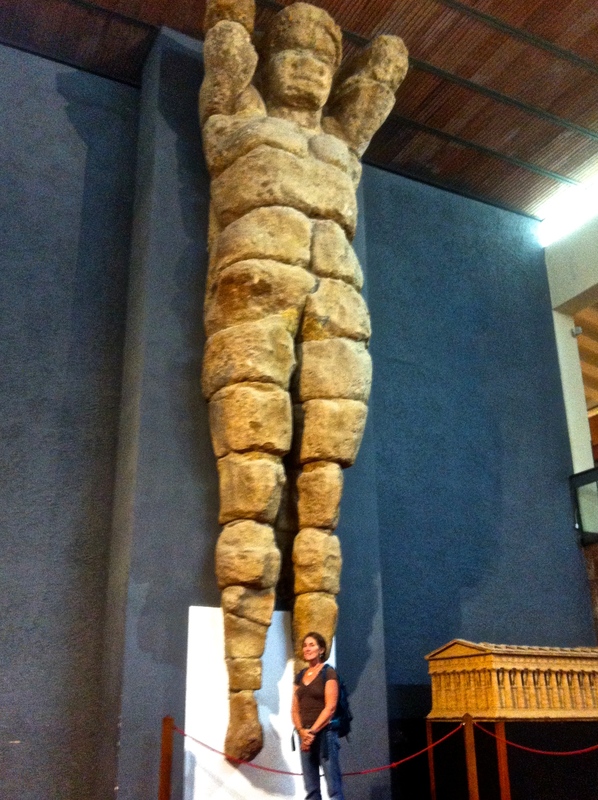 Giant figure that adorned the temple…see model for size reference! 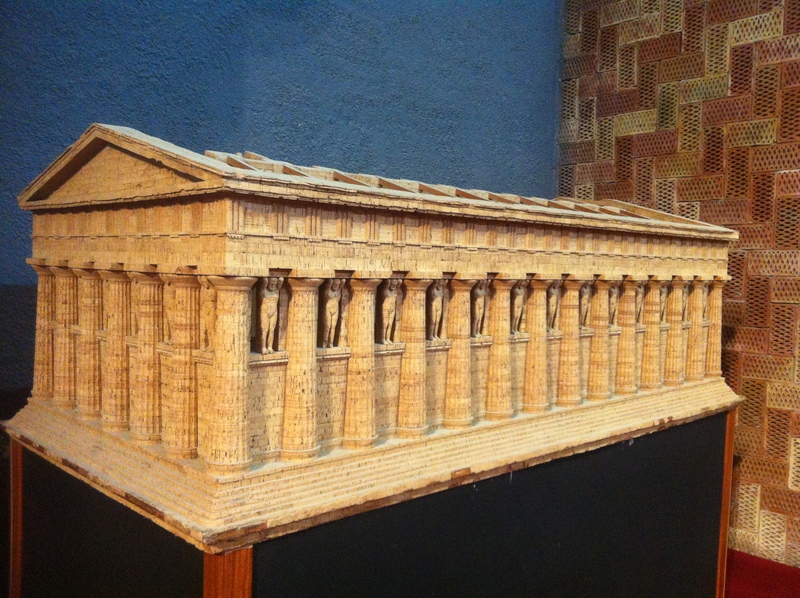 Scale model made from cork. We spent what seemed like a couple of hours inside the museum and then walked throughout the three temple sites, our eyes to the ground looking for pieces of ancient pottery. We both have the “sickness” as Accursio called it, the addiction for looking for archeological finds. Eyes to the ground. Remnants of clay pots lay all around you here and if you take the time to look, you will find many small sherds. Amazing! Small pieces of pottery, some painted black, others grey or terra-cotta in color. 600-700 BC! 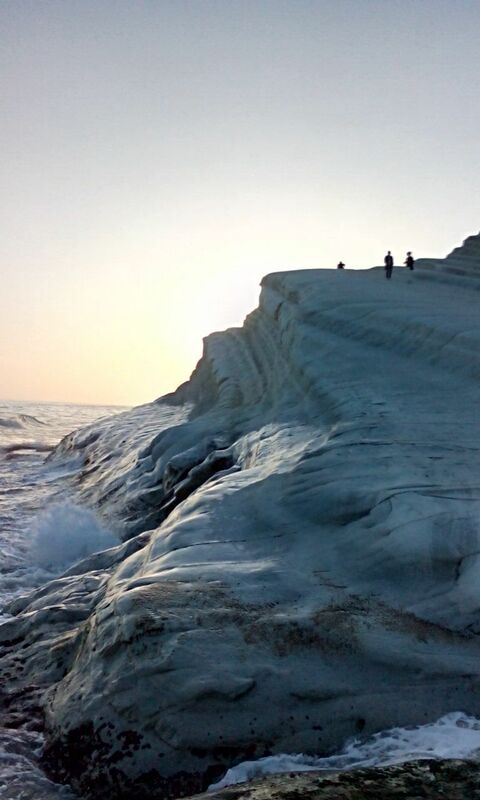 On the way home to Sciacca we stopped at Scala dei Terchi, a white clay cliff on the ocean where Accursio explained how the Arab ships once landed and overlook their enemies, unloading their horses to ride up the cliffs out of enemy view, circling around behind to make their capture. We reached this surreal place at sunset which made for good lighting on the backdrop of white clay, now turning to warm hues in the sunset glow. That night I was met at Accursio’s house by my next host, Giacomo Venezia, a sailboat racer who invited me, along with his 26 year old crew mate, Michelangelo Miceli, to sail east to Siracusa. I met Giacomo (James) at the English class I presented at last week. Though I had just been to Siracusa the week prior, I decided that being on a boat would be a memorable way to see the Sicilian coastline. Giacomo has a regatta coming up and needed to deliver the boat ahead of time. 7 crew members will accompany him for the races. We delivered fuel containers to the boat and had dinner at the marina cafe at the usual late hour of 10 pm or later. 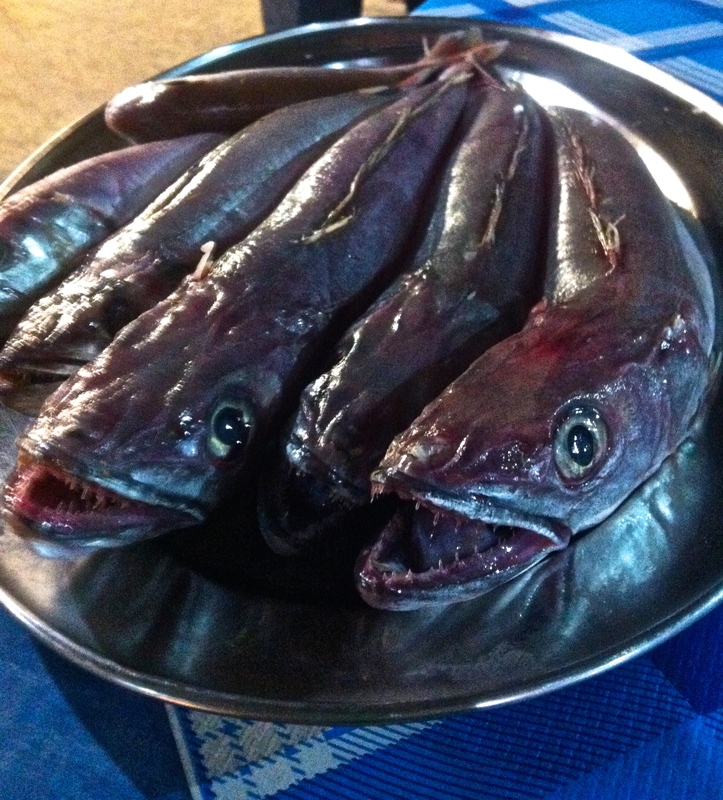 Giacomo ordered cod and the owner brought over a platter of these ferocious looking creatures…not your typical Cape Cod, cod….but a mean looking fish that tasted better than it looked. Scary looking creatures with teeth and an unrelenting stare! Michelangelo arrived soon after and we all went to Giacomo’s place to sleep for 3.5 hours, getting up at 4 am to get ready for our journey. On the way to the harbor we took a detour to find an open “barr”, or coffee shop. We found one open at 5 am and the place was full of men standing around socializing and drinking their morning thick, black coffee. I have decided to dub Italian coffee, “Black Magic”, thick and strong. Giacomo ordered espresso and I opted for a cappuccino since it was a bit larger and the steamed foam looked good. I watched as Giacomo stood at the barr, holding his dainty espresso cup in his large hands, drinking and socializing. I sat and ate my lemon filled croissant and sipped my cappuccino beside Michelangelo enjoying his. We made our way to the boat in the dark, climbed aboard and headed out to sea. It wasn’t soon after that I went below to sleep. I woke to sunny skies and clear turquoise waters, the island shore muted in the distance. It looked like a painting from my perspective and I felt that familiar urge to capture the image with my pastels but figured spreading colored dust onto the white hull of the boat would be an unappreciated mess! Instead, I examined the view and appreciated the values and hues. It was then that I realized that these days, I “paint” in my mind…imagining the process instead of actually doing it. And maybe that’s satisfying enough and is why I don’t paint often anymore? I’m not sure. There are many facets to this. The other is that I’m tired of collecting more “stuff”, and want to lighten my load instead. Art requires lots of “stuff”. I don’t feel the desire to frame paintings and look for galleries. All that seems to be a thing of the past for me. 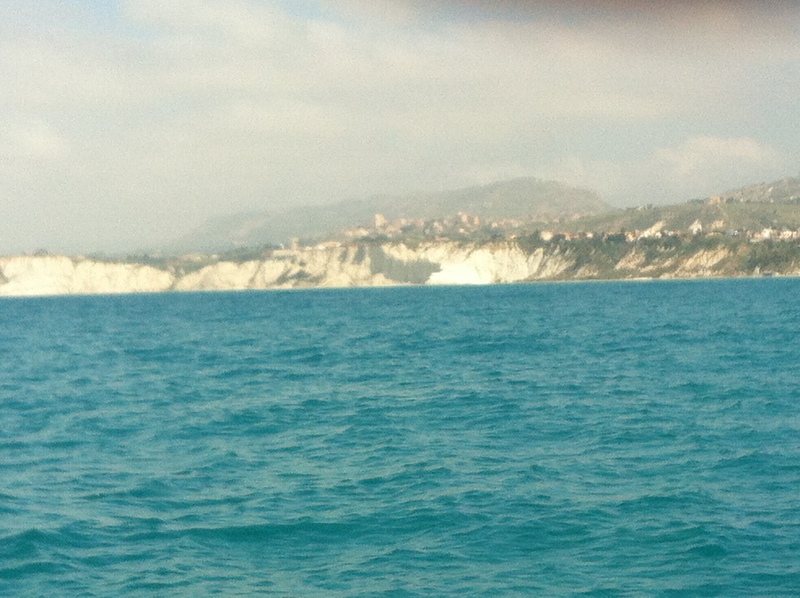 We had to motor the entire way to Siracusa due to poor wind conditions. Giacomo set the autopilot and we took turns keeping watch. The rocking of the boat made us sleepy and I must have had about 5 naps per day during this two day, 25 hour journey at sea! While awake, we kept our eyes pealed for dolphins but only came across a few buoys now and then and saw some passing fishing boats. Day 2 brought many “medusa” or jellyfish and the only other sign of life on the sea were some shearwaters skimming the surface for fish. I was helping Giacomo with some English and the two of them helped me with my Italian. “Jollyfish?” “No, jellyfish” and then explained the word jelly, “like marmalade but clear”. I love the back and forth explanations! It makes for many laughs. 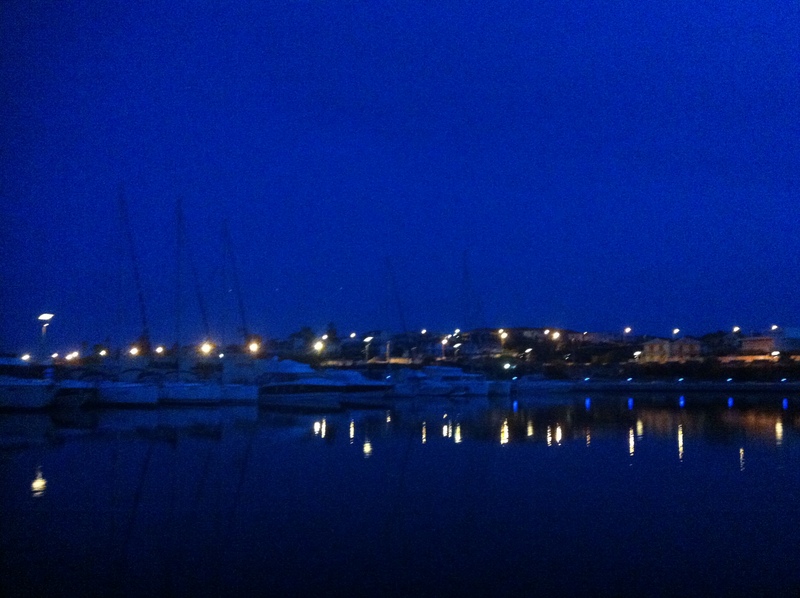 We spent the night in Ragusa Marina harbor and went to dinner on the waterfront. Many people were out socializing, the way the Italians do at night….all dressed in neat clothes and the women in their heeled boots. It seemed to me there was an evening event happening, a show perhaps, but Giacomo told me it’s just what the Italians do at night…they come out to socialize and mingle, not necessarily going anywhere in particular. I imagined Americans out and about doing the same and made a mental comparison…. the Italians seem to be more cultured and finely dressed for such a casual occasion. In America, we find mainly young people “hanging out”, looking for something to do and usually not dressed so elegantly. 🙂 One more interesting cultural difference that makes traveling so interesting….comparing social norms and behaviors. 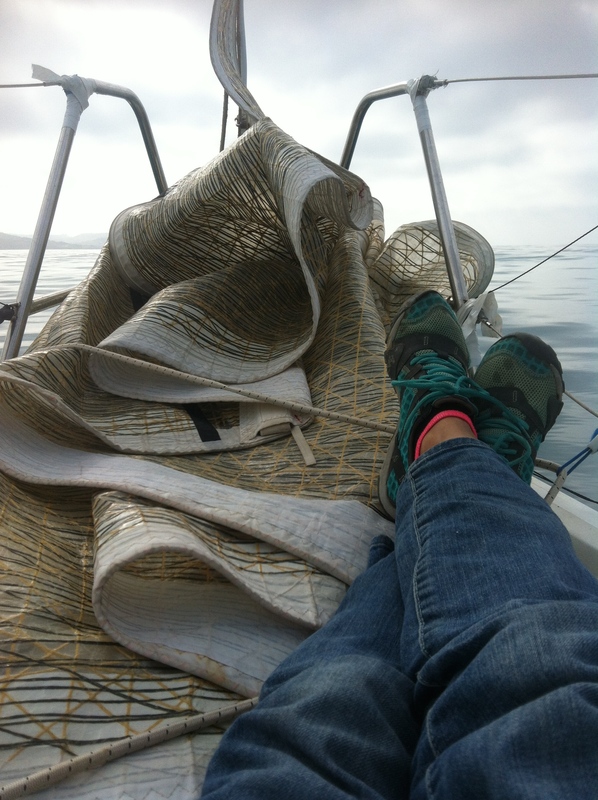 I made a mental plan for “what’s next” as we sailed, asking Giacomo questions about plans and schedules once we landed. He teased me about changing my plans many times. Hmmm…which way to go? It’s a process. I was trying to decide if I should go back to Sciacca with him and Michelangelo by car or go north, back to the farm near Messina. I had canceled my plans to work on a farm on the NW corner of the island because I had misunderstood our travel plans. I didnt know they were returning to Sciacca when I canceled my work plans. Now plan B was formulating. If I have learned anything during these travels it has been the need to be flexible and spontaneous. Spontaneous has always been easy…the flexible part is starting to come around! I rested a while and then went out for a walk, back to Ortigia, the small island point of land where the Temple of Apollo and Greek temple ruins stand, to the place I first met Juanjo, down by the water. I was walking down the street and heard my name called. “Janet??? 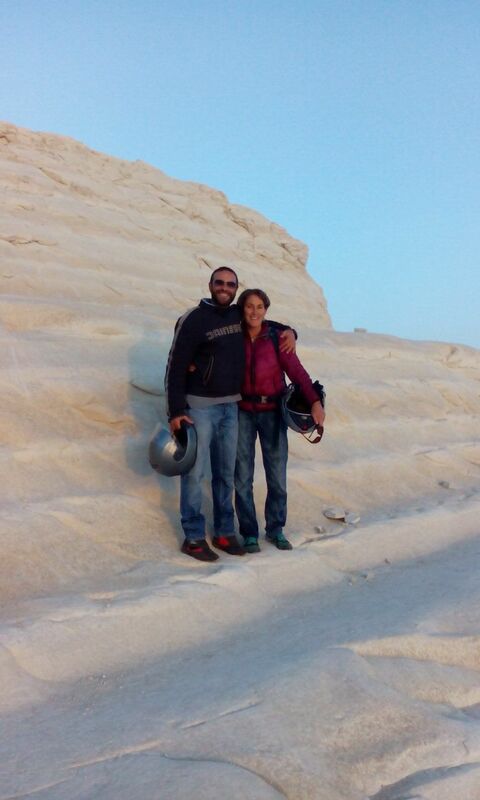 !” Miraculously, it was Aga and Alessandro, my last hosts with Robin, their English teacher from the States! How is this possible in such a large city, to run into people I know? They were as amazed as I was. We chatted a bit and then I went and ate pizza and walked to the piazza to spend some time among giant cathedrals and ancient architecture once again, eating gelato along the way. Next day I hopped the train to Messina, excited to surprise Nadia, Andrea and Lucca at the farm. I took the now familiar bus #79 and got off in Ganzirri and walked to the end of the “lake”, a brackish inlet. I tried to find the steep road up to the house and stopped for directions at a small tobacco shop. As I had never walked home from town when last here, and did not pay good enough attention while a car passenger, I was not sure where to find this road. No one at the shop seemed to know about the road that would take me up to the tower on the hill! After a few minutes of trying to figure out what to do, a car pulled up and outstepped Christina, Lucca’s sister who lives next door to them on the hill! Once again…I was astounded. Again, out of all the people in this large town, I ran into someone I knew? Christina had only come to town to buy cigarettes and just happened to stop at the one shop out of many, where I happened to be standing. The shopkeeper was as amazed as we were and said how lucky I was. Yes! Another mystery of synchronicity. An angel sent to help me! I was excited now to go to the house to find the family. I imagined their response…imagined it as a welcoming, and it was indeed. I walked around the fields first looking for Andrea but only found the horses, donkeys, host of other critters including Margie, the dog. Finally, I found Andrea and his dad in the house. I explained the situation and they were happy I had returned. Nadia came home later and was happy as well. Nadia said, “Guests in Sicily are like the sacred cow in India!” So, I have had four more glorious days of good company, human and animal alike, playing with the horses, working in the garden, harvesting fava beans, helping Andrea build a fence, cooking and eating great food with the family. Tomorrow I leave for Palermo, stopping to visit the seacoast town of Cefalu on the way, then fly to Rome on Saturday. I’m onto the next leg of this wonderful adventure for another month in mainland Italy…first on a farm near the coast in the Maremma region of Tuscany. Here, I’ll live in a caravan surrounded by many horses, alpaca, pigs, guinea pigs, rabbits and a white Tuscan Maremma sheep dog and their owner, Enrico Cheli. Excuse the messy placement of text with photos…this blog format is not easy to figure out! I had a friend in California, Irv Thomas, publisher of Black Bart, who traveled the way that you do, Jan. He also chronicled his travels and there were many, many incidents of serendipity. His consciousness was similar to yours. Sadly, he made his transition a few years ago. He hitchhiked in Europe at the age of 70.